In the last decade, rates of anxiety-related disorders in teenagers have steadily risen, particularly in girls. Researchers and psychologists posit several hypotheses about why these rates are on the rise -- from digital hyperconnectivity to heightened external pressures to simply a greater awareness, and therefore diagnosis, of mental health concerns. Whatever the causes, Dr. Lisa Damour has hopeful news for parents and teens: first, some degree of stress and anxiety is not only normal but essential for human growth. And if those levels become untenable, there are tested strategies for reining anxiety back in. Change and stress go hand in hand -- even if a change is positive. Teenagers' lives are filled with change: Their bodies and brains are transforming, they usually switch schools at least once between grades 5 and 12, their academic workload is increasing, and social relationships are constantly evolving. The anxiety that comes with stretching to face these and other challenges is part of how humans develop strength, said Damour. Sometimes anxiety and stress reach levels that impede a girl’s ability to navigate life effectively. That said, Damour cautions that an emotional outburst -- in and of itself -- is not a reliable indicator of mental health. “If you are raising a normally developing teenage daughter, she will have meltdowns. And there’s nothing you can do to prevent that,” said Damour. This is where a little neuroscience might be helpful, said Damour. “The adolescent brain is very gawky and vulnerable to emotion.” That gawkiness stems from the extraordinary brain development that happens in adolescence. “The brain is upgrading, but in the same order as it initially developed,” said Damour, from the more primitive regions that house emotions to the more sophisticated regions that regulate perspective and problem-solving. Teenage girls are particularly sensitive to the cues they receive from parents and teachers – from words to facial expressions. How adults respond to teens’ emotional reactions matters a lot, said Damour. When adults become anxious in response to a teen’s anxiety, it exacerbates the situation. 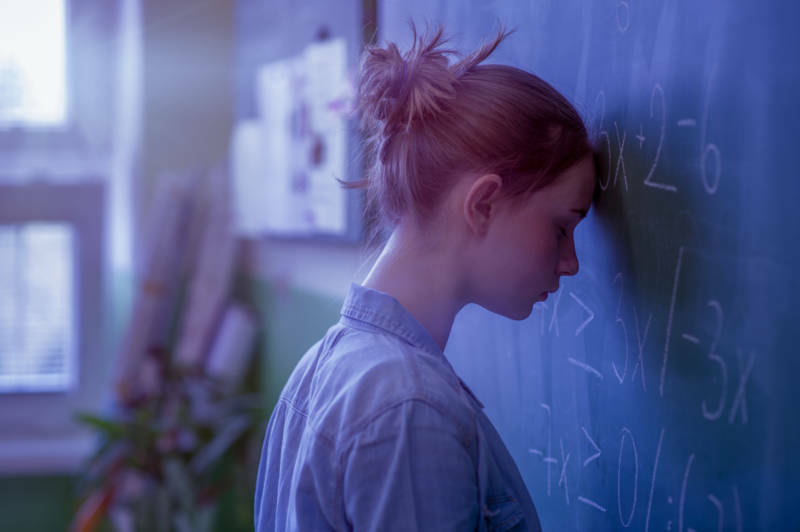 Helping girls weather stress storms can be “excruciating for parents,” and Damour said she understands the almost primal desire to alleviate the pain, solve the problem for them or remove the stressor -- such as letting them stay home from school if they are anxious about a test. But avoidance feeds anxiety. Girls often feel stressed because they overestimate the difficulty of a situation and underestimate their ability to deal with it, said Damour. When they avoid a situation, they miss the opportunity to correct that perception and recognize their own strength. In strength training, “you can’t just lift weights day after day after day,” said Damour. “In order to get the full benefits from the workout, your muscles need a chance to recover and repair.” The same holds true for the brain. If teens accept that some level of stress is inevitable, they can spend less time worrying about stress and more time focusing on how they can build in recovery time. “The good news is your mind recovers a lot faster than your muscles do. But you need to restore yourself so you can go right back in for another workout. Your job is to figure out how you like to recover. What’s the system that really works for you?” For some teens, playing sports gives them the reboot they need to focus on academics. Another student might benefit from a watching a 22-minute episode of a sitcom, playing with a dog, going on a walk or listening to a favorite music playlist. Having conversations with stressed-out teens about this type of downtime redirects the attention away from the stress and toward the recovery. Students can’t always control the stressors in their life, said Damour, but they can have a say over how they choose to restore themselves. When it comes to sleep, she says, small changes can make a big difference, including completing as much homework as they can during the schoolday, making judicious choices about how much time they spend on any given assignment, and monitoring social media use in the evening. According to Damour, the most powerful force for good in a teenager’s life is a “caring, working relationship with at least one loving adult.” Within that context, adults can offer teenagers empathy, grounded perspective and a vote of confidence as they work through challenges -- helping them aim for courage, not avoidance.